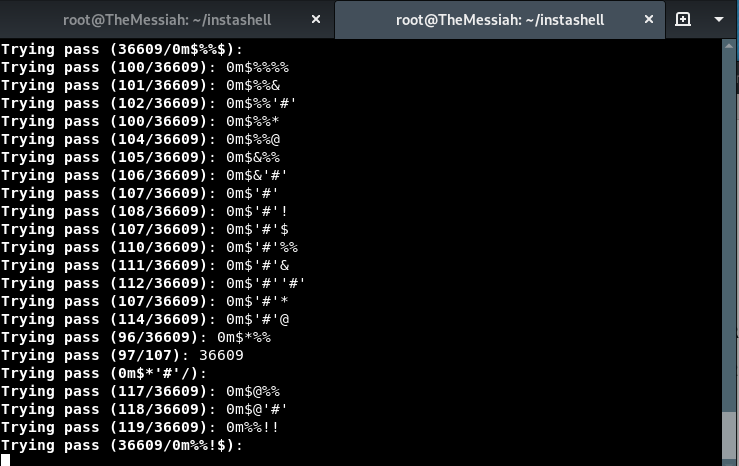 Today yet another tutorial on how to bruteforce an Instagram password, this time using a script called “InstaShell.Sh”. Now before we begin, lets get into some scenario phases first. a) If the target is someone you have not much information on, then i suggest using the two largest password list that can be found here. If you would like to go through other already prepared wordlist, check this link out. b) If the target is someone you know personally, then to prepare the password list, i suggest using cupp.py. You can refer to my video here. c) Finally place the newly created password list in the instashell folder. 4) Type: ./install.sh to install. 4) Now before we begin running instashell, its best to turn on your tor service. If you do not already have tor installed, refer here. 7) Type in target Instagram username. 8) Type in the name of the password list you placed in the instashell folder, or you could rename your password file to “passwords.lst” which is the default password list provided by instahack and just press enter at this stage. 9) Lastly choose the amount of threads, as shown 20 and below. 10) And finally press the magic button. “Enter”. Posted in Blog, Bruteforce, Tutorials and tagged #bruteforce, #darkc0de, #Hackers, #instashell, #messiahcybersecurityandconsultany, #rockyou, #TheMessiah, #torservice, Anonymous, hacking, instahack.